We only sell A* and B* Grade Elk & Moose Antlers! There are 3 grades to antlers A, B and C. A's are fresh this years drops (dark brown) and B's are a seasoned drop (about one year, making them a little harder and a brown to white color. Now for C's called chaulky whites (because the feel like you just picked up a piece of chaulk when handled) these are the worst antler around and there are big companies that are in lare chains selling them. They can be dangerous, they are brittle and extremely cracked. Almost all antlers will have a some cracks but a "C" antler looks like it has been dehydrated! Elk and Moose antler chews and contain many of the best nutrients that your dog craves. A great natural source for calcium, phosphorus, potassium, sodium, magnesium, iron, zinc & manganese. All this in a compact, odorless and mess-free, all- natural dog chew form. Your dog will love em. Being hard antler exposed to the weather, Antler Chews are stronger than raw bones and are of a finer texture. 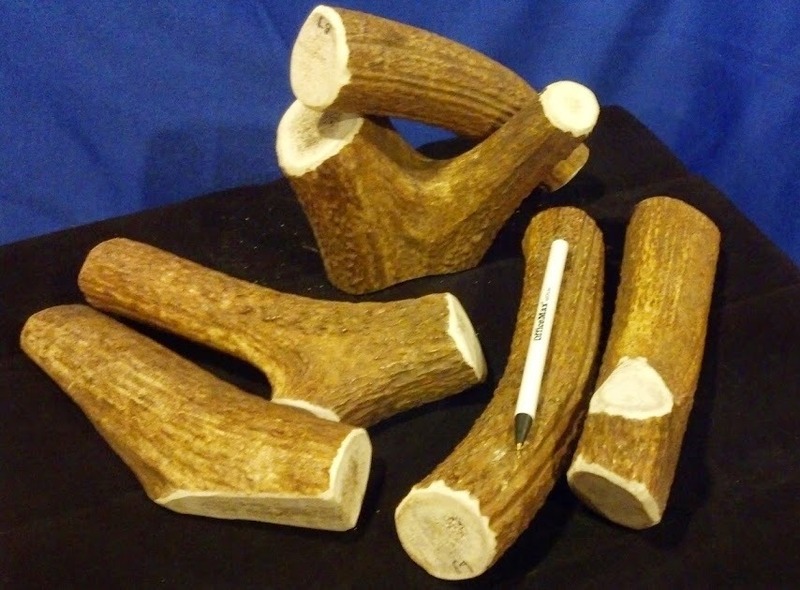 Antler Dog Chews cut from real hard antler will not easily break, chip or splinter like cooked or raw bones might. Your dogs chewing action and the digestive action of the dogs own saliva slowly yields delicious morsels of antler for your dog to enjoy. Antler chews are long lasting, tasty and safer for your dog! So its easier for you to reward your favorite pet. However always use caution when first offering your dog an antler treat. Supervise their activity so they do not attempt to swallow or break the antler. Always buy antler chews approximately proportionate to your dogs body size. CAUTION: Like for any new chew toy or special dog snack, ALWAYS supervise your dog when giving antler chew sticks or buttons. Do not allow them to try and swallow them or break them in half. 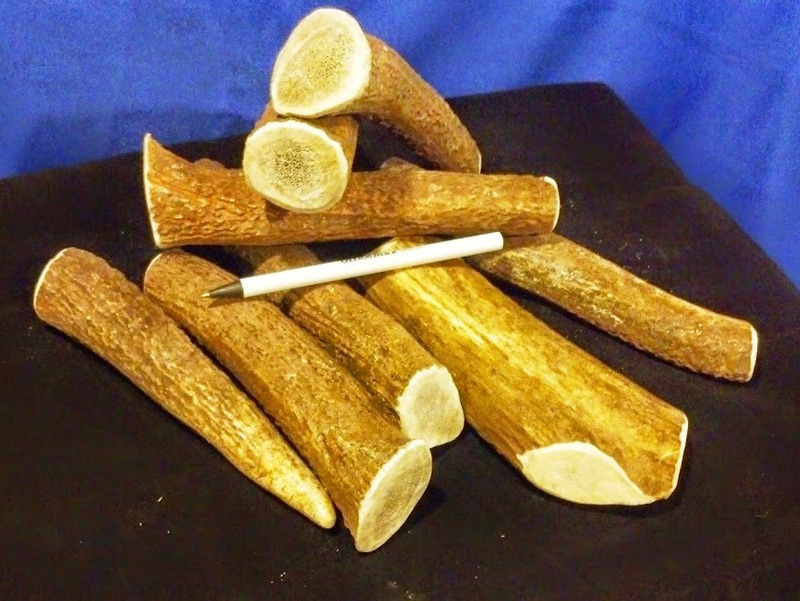 These natural antler chews are very hard and can break teeth if too aggressively chewed. 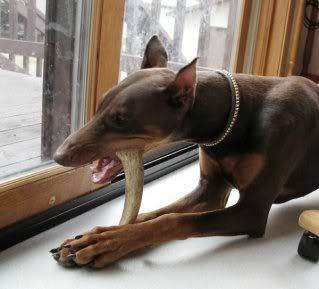 Some dogs get overly possessive of dog antler chews. Always use caution when taking an antler chew toy away from your dog. Why we do NOT sell Split antlers: The reason we do not sell splits is that a strong young dog will be able to dig the marrow out REALLY fast leaving the shell of the antler that can be broken by the dog and swallowed! Why take the risk! These are rough guide lines, every antler is different due to it being a natural item. Hooper really loves his Elk Antler. He's on his second one. He has a history of destroying things with his strong jaws and we are comfortable letting him chew these without worrying he'll end up at the vet. Thank you Dan for the tip to run it under hot water if he stops being interested in it. Works like a charm! Suki was so happy to get her new antler today, she had only a little stub left of her old one. Thank you Dan and Kelly! Xylas is loving it!